New video on Music -page! Check out my funky cover version of the J. Karjalainen classic Sekaisin on my Music page. Here is my performance as one of the members of the trio at the Battle round of the Voice Of Finland. The other singers of our trio are Young and very talented Sini Järvinen and Reetta Lantta. The song is a classic Finnish soul tune Ainutkertainen which is one the biggest hits of a Finnish soul legend Sami Saari. I made this arrangement. 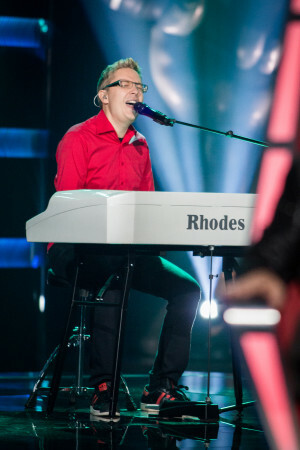 Mikko Pettinen made it through the Battles -round in The Voice Of Finland!! Mikko Pettinen is a contestant of The Voice Of Finland 2015! Yes, it is true: I am one of the contestants of this year´s The Voice Of Finland! Check out my performance in the Blind auditions on Nelonen on Feb 6th at 20:00 or ruutu.fi. That´s the episode 10. Tell me what you thought about at my Facebook page or Twitter or Instagram. You can find the links on the contacts -page. This album is my debut as a jazz singer, because I´m singing two jazz standards on it: Night And Day and How Deep Is The Ocean. Check it out! Mikko Pettinen: 2HAPPY album is out now!!! You can buy it from me (send me an email or like my Facebook page and send me a message and I´ll send you the cd) or click some of the links on the left side of this home page and buy it. Check out the great reviews on REVIEWS page. Check out some energic new live videos with my soulband Happy People on the MUSIC –page! Check out also Finnish singer Sandhja´s debut album Gold which was released on May 2014. I made all the horn arrangements for it and play trumpet and flugelhorn on it. Samba á Venda feat. Felipe Salles & Mikko Pettinen –album will hopefully released this year. It´s gonna be great! I´m producing an album with a Finnish singer/songwriter Hanni Angelaho. I´ve done all of the arrangements and I play piano, trumpet, flugelhorn and sing background vocals. The music on the album is mostly acoustic and intimate folkpop with some soul, tango and Finnish schlager influences on it. The album will be released soon.